6 Stage - Water Pro US Water Reverse Osmosis Filtration System with Premium LiquaGen Mineral Filter. Our Reverse Osmosis Water Filtration Systems provide bottled water quality at a fraction of the cost! This is a fully loaded system which includes all the components needed to make ultra-pure water. 100 % Built in USA. Pressure Tested System Ensuring the Highest Standards of Quality. Designed with the markets finest pump - Permeate Pump 1000 by Aquatec. Stage 1,2,3 (Change Yearly). 4 REVERSE OSMOSIS DRINKING WATER FILTER SEDIMENT/CARBON. 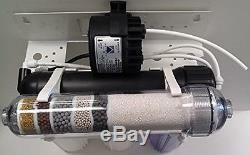 75 Gallon Per Day - Reverse Osmosis Membrane Drinking / Aquarium Water Systems. ALKALINE/ KDF DRINKING REVERSE OSMOSIS WATER FILTER INLINE. FEATURES AND BENEFITS OF PERMEATE PUMP. Requires no electricity, powered by energy. The original Permeate Pump (ERP1000) is a simple, yet revolutionary, device. Powered only by the hydraulic energy of brine water usually lost to the drain i. No electricity required, the Permeate Pump forces product water into the storage tank, reducing membrane back pressure and maximizing available feed pressure. These pumps dramatically improve the efficiency of R. Water production, reducing wastewater by up to 80%. Permeate Pumps can also bring storage tanks up to line pressure and then shut the system down when these tanks reach capacity, eliminating the need for a hydraulic shut-off valve. Water production, superior water quality, and extended filter/membrane life. Improves recovery rates by as much as 400%. Reduces waste water by as much as 80%. Ideal for membranes rated from 10-100 GPD. Effective for inlet water pressure as low as 30 psi. Increases membrane life, lowers TDS creep. Fills product tank up to 4 times more rapidly. CARBON BLOCK FILTER (5 MICRON). MEMBRANE 75 GALLON PER DAY. STORAGE TANK 3.2G/2.8G. ASV AUTO SHUT OFF VALVE. CHECK VALVE ON THE MEMBRANE HOUSING. FDA APPROVED Color Coded Tubing. STAGE: SEDIMENT FILTER 5 MICRON. 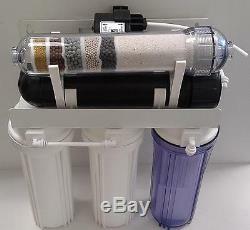 Sediment Filter is a 4 stage polypropylene sediment filter with a high dirt holding capacity. 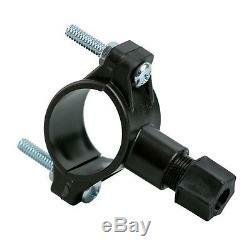 Size: 2.75" x 9.75" fits 10 standard housing. STAGE: CARBON BLOCK 5 MICRON. Chlorine, Taste & Odor Reduction. Made with Premium Quality Coconut Shell Activated Carbon. No Release of Carbon Fines. Fits all Standard 10 Filter Housings. 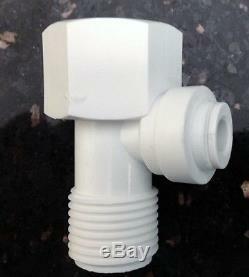 Cartridge is designed for use in Under Sink Filtration & Reverse Osmosis Applications. STAGE: 75 Gallons Per Day Reverse Osmosis Membrane. Stage: LiquaGen Alkaline/KDF/ORP Negative (Antioxidant) Inline Filter. This top quality water is designed and. Made by LiquaGen Water and is tested to restore many of the minerals which get lost during the installation process and act as an anti. Reduce amount of clusters in water molecule from 20 to 5. Develop synergy between the Negative Ion and Far-Infrared , Ceramic Marbles. Create Alkaline Water , Increase pH up to 10.5 Helps the body to absorb minerals better. Emit Far-Infrared Rays, Activate metabolic function. Increase oxygen content in blood. Kinetic Degradation Fluxion media is Known to. Kill algae and fungi, control bacteria growth, reduce chlorine, pesticides. Organic matter, rust, unpleasant taste and odor, hydrogen sulfide, iron. Lead, nickel, chromium, cadmium, calcium, aluminum. A negative ORP indicates the ability to donate electrons, the higher the negative charge, the greater the ability to provide electrons. This is the level of the ability to be an antioxidant. Free radicals are oxidizers and their ability to oxidize is eliminated or reduced by the addition of electrons from atoms with a negative ORP. Substances with a high negative ORP are called anti-oxidants. (Castor oil has an ORP of -200, Great Grandma was right, Castor oil is good for you). The ORP is measured in Mv (millivolts). The lower the ORP (negative value) of the food or drink, the greater potential it has to reverse the aging process of the body at a cellular level. For taste and odor reduction. The following conditions for feedwater supply must be met. RO System must be connected to a municipal or well water source that is. Treated and tested on a regular basis to insure bacteriologically safe water. Operating Temperatures : A Maximum 113° F B Minimum 39° F. Do not allow RO System to freeze. The membrane always contains water and will be destroyed if frozen. Do not plumb RO System to hot water. This will destroy the integrity of system components. If pressure B 40 BelowA pressure regulator is advised to maintain proper pressure. Personal checks may be held until cleared. (REVERSE OSMOSIS) DRINKING WATER SYSTEM. Drinking Water System when installed and operated within recommended parameters, with the exceptions stated below. How Long Does The Coverage Last? Drinking Water System that is damaged because of neglect, misuse, alterations accident, misapplication, physical damage, or damage caused by fire, acts of God, freezing or hot waters or similar causes. The item "6 Stage pH Mineral Reverse Osmosis Water System with Permeate Pump 1000 75 GPD" is in sale since Thursday, March 28, 2013. 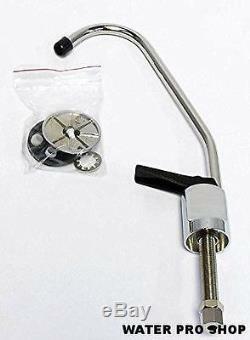 This item is in the category "Home & Garden\Kitchen, Dining & Bar\Small Kitchen Appliances\Water Purification\Water Filters".